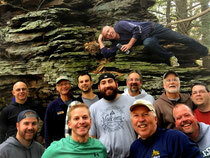 Daybreak's 14th Annual Men's Retreat in North Central Pennsylvania was another fabulous time of refreshment! Our theme was "Don't Stop!" and we were challenged by the faith march of the army in Joshua 6 as they kept on keeping on for 7 straight days circling the city limits of Jericho. On Friday night of the retreat, each of the 15 guys shared a specific action that they want to take and no matter the difficulty their desire is to push forward and keep on keeping on. Then to commemorate this decision, each guy took a victory lap around the yard, receiving high fives and verbal encouragement from the others to keep going and not stop! 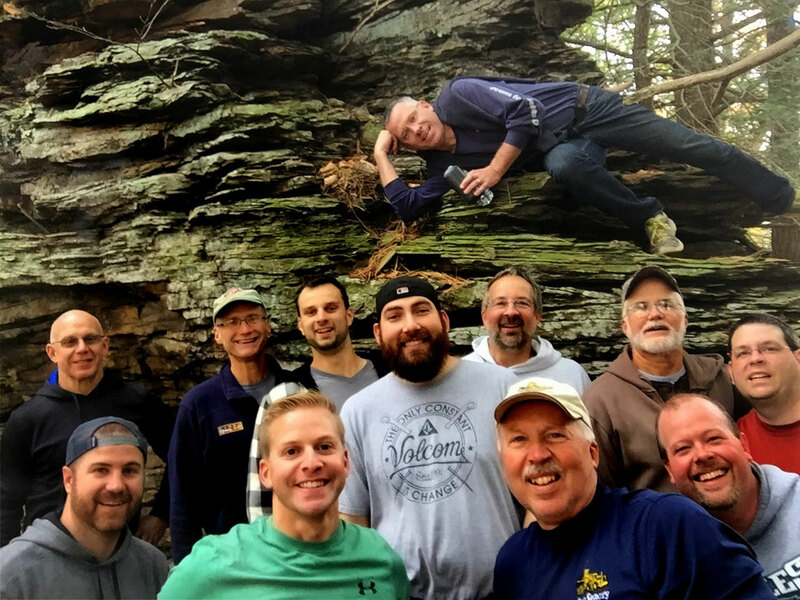 On Friday, 12 of the guys went on an epic 3-hour hike up a mountain which had its moments of hilarity, breath-taking beauty, perseverance, conversations, and lasting memory! One brave man positioned his iPhone on a thin tree branch and set the timer to snap this photo of us surrounded by massive rock formations at the summit! We enjoyed a delicious and entertaining dinner at the Sportsmen's Lounge on Thursday evening but it was nothing compared to the amazing feasts provided by Chef Phil, complete with homemade apple pie and ice-cream following our evening session together! Thanks again Phil! Thankfully there were no injuries to report following competitive games of wiffle ball and croquet, some chainsaw tree-cutting action, target-shooting, and another Martin/McCarter firework extravaganza! Thanks to all the guys who carved out the time from work and family to attend! I trust the time was fun, relaxing, and spiritually encouraging! iPhone, iPad users cannot view the Flash slideshow above; instead go to Google to view.